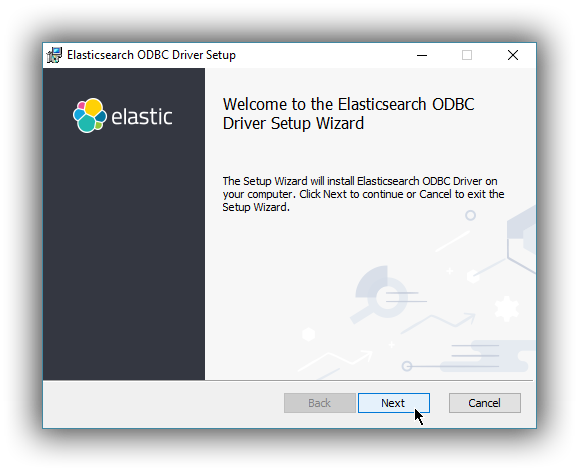 The Elasticsearch SQL ODBC Driver can be installed on Microsoft Windows using an MSI package. The installation process is simple and is composed of standard MSI wizard steps. If you fail to meet any of the prerequisites the installer will show an error message and abort the installation. It is not possible to inline upgrade using the MSI. In order to upgrade, you will first have to uninstall the old driver and then install the new driver. 32 bit driver (x86) for use with the Microsoft Office 2016 suite of applications; notably Microsoft Excel and Microsoft Access and other 32 bit based programs. 64 bit driver (x64) recommended for use with all other applications. Users should consider downloading and installing both the 32 and 64 bit drivers for maximum compatibility across applications installed on their system. Double-click the downloaded .msi package to launch a GUI wizard that will guide you through the installation process. 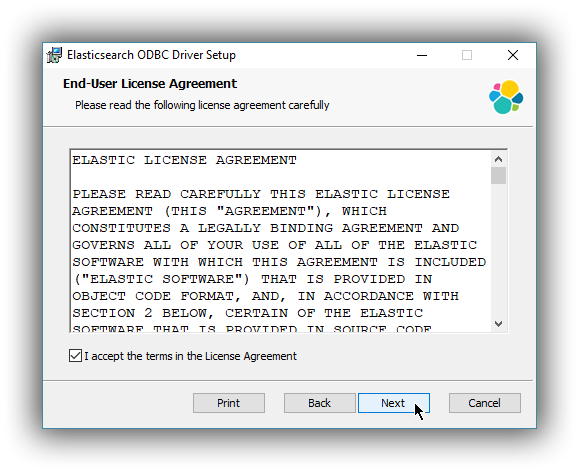 Clicking Next will present the End User License Agreement. You will need to accept the license agreement in order to continue the installation. 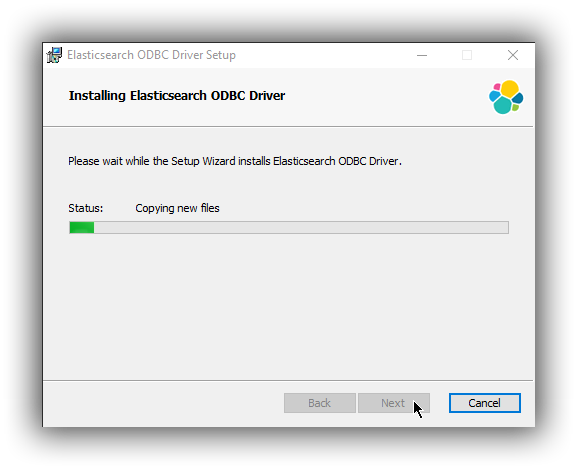 The following screen allows you to customise the installation path for the Elasticsearch ODBC driver files. You are now ready to install the driver. You will require elevated privileges (administrator) for installation. 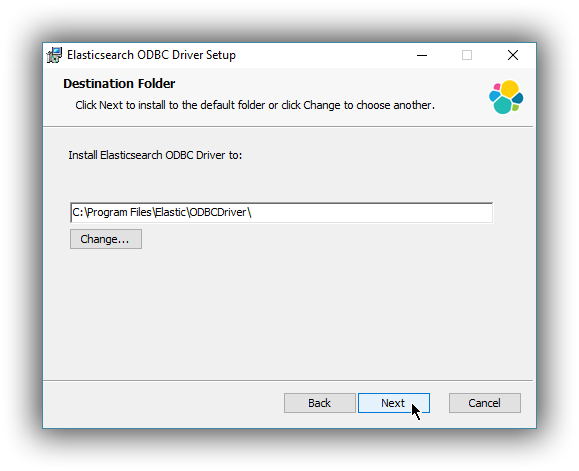 On the finish screen you can launch the ODBC Data Source Administration screen by checking the dialog checkbox. This will automatically launch the configuration screen on close (either 32 bit or 64 bit) where you can configure a DSN. As with any MSI installation package, a log file for the installation process can be found within the %TEMP% directory, with a randomly generated name adhering to the format MSI<random>.LOG. 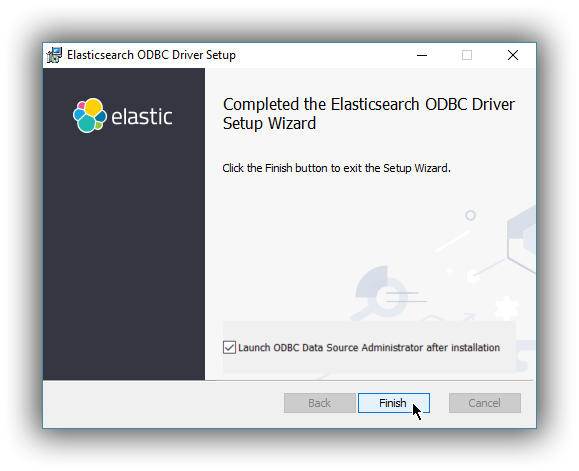 If you encounter an error during installation we would encourage you to open an issue https://github.com/elastic/elasticsearch-sql-odbc/issues, attach your installation log file and provide additional details so we can investigate. 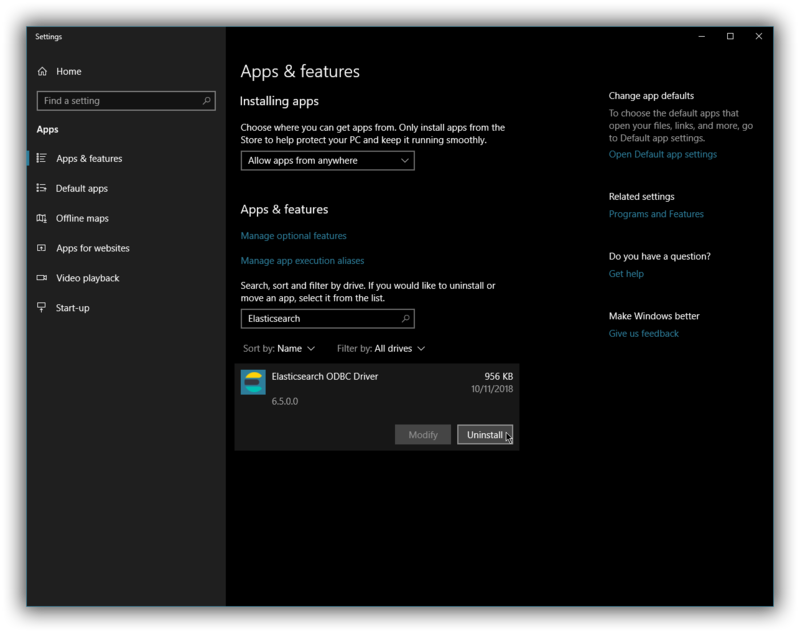 …or by consulting the Windows Installer SDK Command-Line Options. The installation directory. 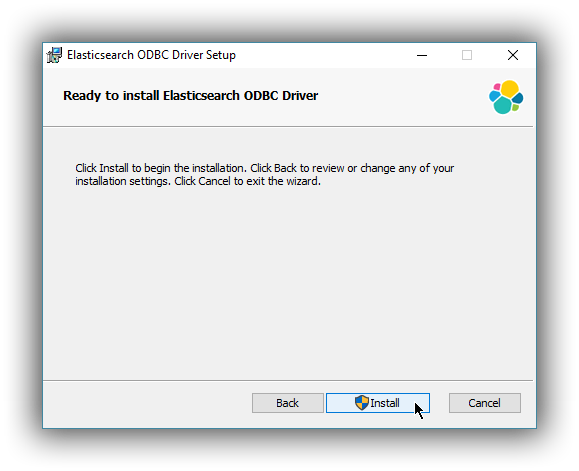 Defaults to %ProgramFiles%\Elastic\ODBCDriver\7.0.0. start /wait msiexec.exe /i esodbc-7.0.0-windows-x86_64.msi /qn INSTALLDIR="c:\CustomDirectory"
Uninstallation will remove all contents created as part of installation. An installed program can be uninstalled by pressing the Windows key and typing add or remove programs to open the system settings.